Flowers in the fog, a photo by The Bacher Family on Flickr. For the first day of spring, a day in which it snowed all the way down to our home elevation at 920 feet above sea level, a trip down memory lane to warmer times. 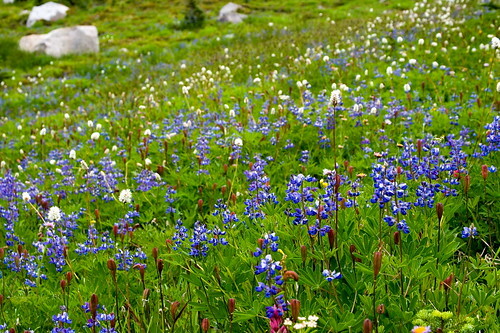 Of course, in Washington, it's worth remembering that even the riotous flowers of summer often bloom under cover of clouds and fog -- especially at high elevations. I took this photo during a memorable hike to Spray Park in August of 2007, a day that began with nice sun breaks but ended up fogged in in the high country, with no hint of the grand Mountain on the horizon. Still, clouds turn the sky into one enormous softbox, and the colors can be even more vibrant than on a sunny day when they're washed out by the sun. 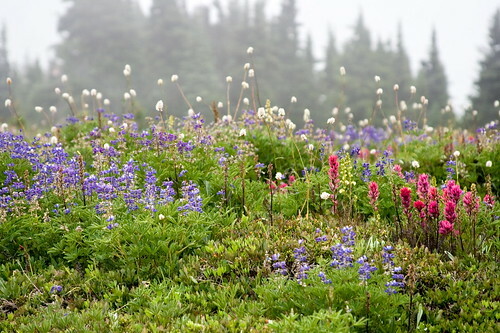 I especially like this picture because of its many layers -- the sharply focused lupines and painbrush in the foreground, the out of focus bistorts behind them, and the subalpine firs fading into the fog in the background.